Security, control and management for their own sites by their own IT staff. Delivery of a service that is outside of the standard commercial services, perhaps to support smaller antenna and transmission equipment at remote sites, or larger carriers, or features such as mesh support that are not part of the standard commercial service. Organizations may want to run and operate their own commercial VSAT service and isolate it from BusinessCom’s commercial services – perhaps to target a particular market for which they offer a value-add. Launching a new VSAT service can be a daunting affair. There are considerations for high speed redundant backbone connectivity with different Tier 1 Internet providers. There is all the expensive earth station equipment – very large antennas and transmitters as well as redundant components, power backup and support staff. These issues could make private networks rather expensive to implement and unrealistic for many, if not most clients. Space segment is expensive, particularly when you don’t have existing relationships with the satellite providers and volume discounts as a result of existing commercial services. On-site staffing is required to manage and monitor the system, with tasks that range from replacing failed components, to sweeping snow off the earth station antennas. The iDirect system is designed in a modular fashion such that a client can set up a VNO (Virtual Network Operator) without incurring all the startup expense of the Host Network Operator (HNO). A VNO customer may purchase a VNO license and line cards for one or more slots in the HNO’s iDirect Hub in order to run their own private network that is completely isolated from the HNO’s network(s). The financial outlay for this is much less since the client leverages the existing infrastructure. 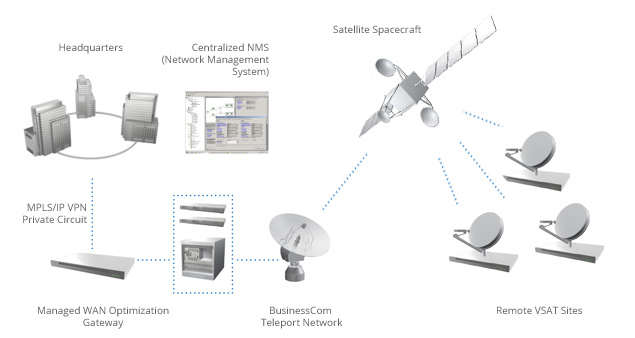 In most cases, the HNO provides the space segment (satellite capacity) for the VNO, in addition to making the hub real estate and teleport infrastructure available. BusinessCom deploys VNOs for a variety of applications. In some cases the client may privately and remotely manage their own VNO after sending their technicians to iDirect for training, and in other cases, BusinessCom will provide VNO management services so the client does not have to acquire technical expertise which may be outside the scope of their primary business model. Utilizing configuration tools provided by iDirect, BusinessCom will work with the VNO prospective client to help them determine how much capacity they need to deliver a particular service based on criteria such as carrier sizes, hardware sizes, service quality (oversubscription ratios), type of traffic (voice, video, data) and budget.